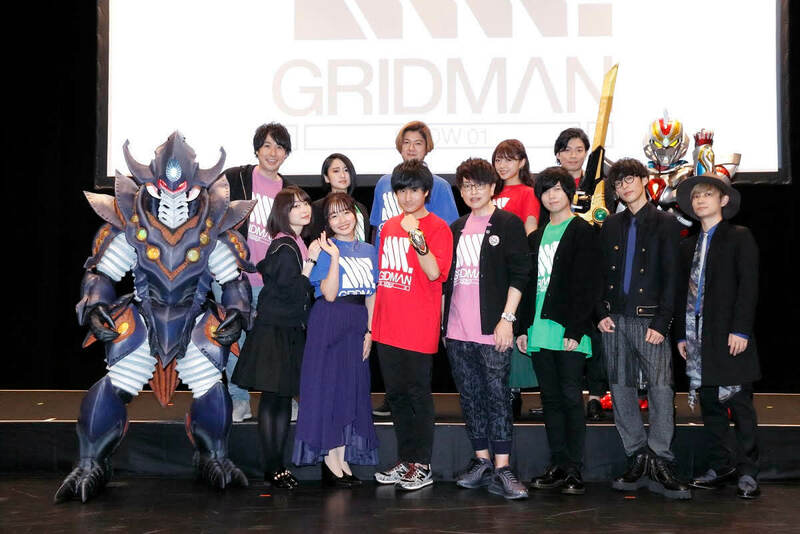 The first live event for the TV anime series SSSS.GRIDMAN titled “SSSS.GRIDMAN SHOW 01” was held at TFT Hall in Odaiba, Tokyo on February 3, 2019. The event began with a screening of famous scenes from the show. Each member of the voice acting cast was then welcomed on stage one by one with huge rounds of applause: Yūya Hirose (who plays Yūta Hibiki), Hikaru Midorikawa (Gridman), Sōma Saitō (Shō Utsumi), Yume Miyamoto (Rikka Takarada), Reina Ueda (Akane Shinjō), Ryōsuke Takahashi (Samurai Calibur), Aoi Yūki (Borr), Masaya Matsukaze (Vit), Kenichi Suzumura (Anti/Gridknight), and Suzuko Mimori (Namiko). Warning: This article contains spoilers for scenes in the series. The event was led by actors Ryōsuke Takahashi and Masaya Matsukaze. It was accompanied by performances from Hirose, Saitō, Miyamoto and Ueda who each performed their own character’s song. For Yūta’s song voice actor Hirose got the crowd pumping by saying “I can’t hear you!” Fans waved their red pen lights to each tune. The cast also got into character to read some scenes aloud. Tetsu Inada, joined in too who voices the digital being Alexis Kerib. One scene included Akane Shinjō summoning a Kaiju after becoming offended. Alexis got the whole room to shout “Instance Abreaction” at which point Wooser from the TV anime series Wooser’s Hand-to-Mouth Life suddenly appeared. Gridman appeared on stage, saying “We can’t continue our reading like this,” but he did not fight Wooser, instead escorting him away in a gentlemanly manner. Anti showed his fighting spirit when Gridman walked on stage. Borr pointed out that “We don’t have the budget to pay the GRIDMAN production team to make mascot costumes.” However, a mascot dressed as Anti in his Kaiju form stepped on stage, delighting even the crowd. The atmosphere was truly one of a hero show. The audience also called out the words “Access Code Gridman Calibar” at the call of Samurai Calibar at which his sword was sent to where Gridman was. Gridman and Anti got into a heated battle. Fans cheered on with Gridman coming out as victor. It was a spectacular fusion of reading aloud and acting. Music duo OxT came onto stage to perform a cover of the song Yume no Hero, the main theme for Gridman the Hyper Agent. Guitarist Tom-H@ck said, “I’ve really been looking forward to today, but we had to wait so long. I was worried our names weren’t written down.” Vocalist Masayoshi Ōishi invited laughs as he took out half a ticket on stage and said, “Even though our names were clearly written down it feels like we’re being treated like secret guests. The two musicians continued with UNION, the opening theme for SSSS.GRIDMAN. Their performance ended with Ōishi doing the Access Flash pose. 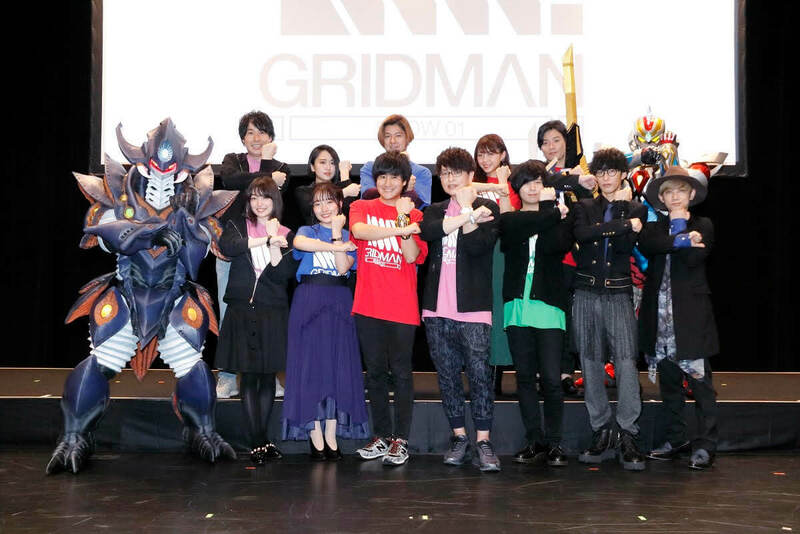 The voice cast returned to the stage to announce that a second show, SSSS.GRIDMAN SHOW 02, will take place on May 26, which drew cheers and a round of applause throughout the room. The event wrapped up with the screen showing the final live-action part of the series and announcing that a music video for UNION is currently in production. *Full details TBA on the series’s official website and Twitter.